I am a big time fan of author’s first book – Finders, Keepers. Therefore, I read UNNS twice so that my fondness for Sapan didn’t cloud my judgement while reviewing his second book. 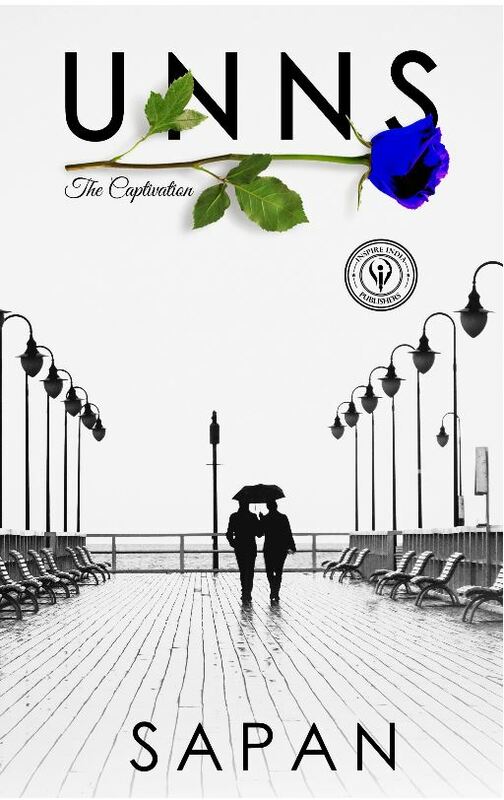 Let’s start with the cover page of the book – UNNS, the second stage of love, blue colored rose and the sub-title ‘The Captivation’. Everything depicted on the cover page beautifully carried the idea of what lies ahead. A young story, darkness of human emotions, love, betrayal, rage, regret and what not. UNNS is story of Atharva and Meher. I said story because contrary to the fact, it is not a typical love story. This book is a soul who lived all seven stages of love again and again and finally breaks away the captivation in the end. Destiny bring a young couple together attaching them with the invisible string of fate. Same twisted fate tread different path for them setting them apart and then bringing them together again and again. Story moves with a constant pace with flashbacks and current events along with the twist and suspense at the end of almost every chapter. Setting of the story and the sub-plots created all necessary elements. First – Title and the book even the blurb talked about all 7 stages of love. Sapan managed to arrange chapters of the book with the chronological order of all 7 stages along with the weather. And he did a full justice to each stage. I mean, if the stage is ‘maut’ then the subsequent paragraphs will take the story towards the same fate. What is phenomenal is that along with this, both Atharva and Meher lived there own 7 stages of love interwoven layer by layer in the story. Very few authors think about naming the chapters with such creativity and interlace it with something so complex yet succeeded to keep it simple. Second – From very initial chapters Sapan started scattering breadcrumbs for readers to catch. You have to focus on every small details, tiniest hint to appreciate the book. Everything has a purpose, every paragraph has a reference. Even the details as insignificant as the favorite dishes of Atharva and Meher. This is a genius masterstroke by Sapan. Third – Some words are best left unsaid. Sapan cleverly dropped some of the conversation at the cliffhanger. Trusting readers to guess the emotions embedded in the heart of the characters and in the process connect with them. I think this gave diversity to the book, not all readers think alike. You may have your own unique version and I can have my own version of the same story. It gave me a sense of purpose while reading this book. Finally, Sapan’s UNNS is not perfect but the question we should ask – Who want perfect? Atharva and Meher made different choices in life, choices which destroyed them, gave solace and closure. In the end, they both saw the order in chaos. Chaos of shrewd mind and innocent emotions.